Villa Aye is a vacation home built to impress. 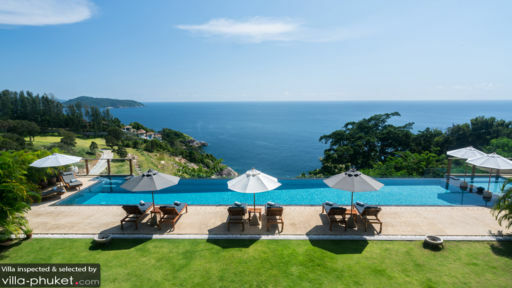 Set in a prime spot in Cape Amarin (also known as Phuket’s “Millionaire’s Mile”), the villa commands unobstructed views of the Andaman sea and vast expanses of tropical greenery. Furnished with a wide range of luxe amenities, Villa Aye gives travellers plenty of reasons to stay in. But if you’re itching to explore the island, take heart, for planning day trips out from the villa is a breezy affair. A variety of attractions are located close by: Kamala is a 10 minutes’ drive away, Laguna Golf Club and Canyon Golf Club are about a 30 minutes’ drive away, and a 40 minutes’ drive will lead you to Phuket Town. Eight bedrooms sleeps a total of sixteen guests. Three of the rooms come equipped with king beds, four offer singles that are converted to form a king bed, while the last bedroom offers two singles. Amenities, such as air conditioners, telephone, safe, working desks, sofas, arm chairs and an opulent en suites featured in all bedrooms. You’ve got no excuses for missing out on your daily laps when you’ve got an expansive infinity pool to call your own at Villa Aye. It also offers a perfect spot to enjoy views of the villa’s scenic surroundings during mid-day; a dip in the sparkling waters serves as an effective remedy against the heat of the tropics. Recliners and sun umbrellas pepper the lounge, providing a comfortable seat for guests who prefer to keep dry. Keep the parties rolling during your stay - the commodious lawn is ideal for hosting events for about 100 guests. 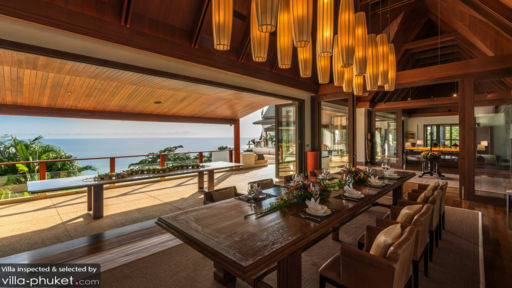 Designed by a leading local architect, Villa Aye blends contemporary design elements with touches of traditional Thai. You’ll find modern pieces set next to oriental ornaments in this finely-appointed home. You’ll have two indoor options for dining; choose between a 12 seater table furnished in minimalist Japanese design, or a grand 14 seater accompanied by plush leather chairs. You’ll also have the following facilities at your disposal: gym, yoga room, mini-library, indoor bar, DJ music console, and Bose surround sound system. Villa Aye is a full service property. The following amenities are included with your stay: housekeeping service, security service, guest services and gym facilities. Laundry service, in-villa massages, vehicle rental, personal driver service and child-minding service are available at additional cost. In-villa dining experiences are charged at the cost of groceries + 20 percent. Villa Aye is located in Kamala, a coastal town north of Patong. Unlike its bustling neighbour, Kamala features a laid back atmosphere, and attracts a crowd largely made up of expats and family vacationers. Kamala Beach is a great spot for beach strolls, sunbathing, diving, stand up paddling and surfing. The southern end of the beach may get busy during the peak season, but the northern end remains quiet and free from the tourist crowds all year round. Restaurants and beach bars dot along the coast, offering beach goers with a good selection of dining options. Away from the beach, enjoy a day of family fun at Phuket Fantasea, a theme park with myriad dining, shopping and entertainment options. Kamala night market, a weekly event held every Friday night is a great way to experience the local food and shopping scene. Unwind with incredible spa treatments at Spa by Paresa or Oasis Turquoise Cove Spa Phuket, or join in yoga classes at iYoga or Anantra Yoga Patong. In-villa yoga and spa sessions may be arranged at request - just reach out to your villa manager for assistance! 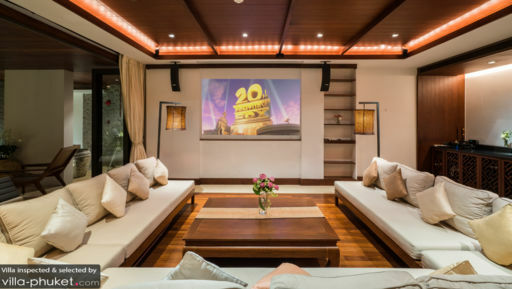 Villa Aye offers easy access to dining establishments in the vicinity, which includes options like HQ Beach Lounge, Vanilla Sky Bar and Lounge, Silk Restaurant and Bar, as well as Siam Authentic Thai Restaurant.